Lauren Barnholdt is the author of several Young Adult and Middle Grade books, such as Two Way Street, Watch Me, Aces Up, and The Secret Identity of Devon Delany. Her new book, One Night that Changes Everything is out today. I had the honor of interviewing her about her book. 1. Eliza has quite the night in One Night Changes Everything. What inspired you to write about one crazy night that is full of adventure, fun, and some blackmail? Did you ever have a night like that as a teen? No, definitely nothing as crazy as what happened to Eliza has ever happened to me! But like her, I am kind of scared of things I probably shouldn’t be. That’s where the inspiration came from – tapping into that desire to face things that aren’t really that big of deal. 2. Eliza's book of fears is and what leads to her to this amazing adventure. Do you have any fears that you helped you relate to Eliza and her purple notebook? 3. You write Young Adult, Middle Grade, and Chapter Books. What helps you write such different genres? I think for me, it starts with a situation or a character, and then the story and genre comes out of that. For example, I wrote my first middle grade, THE SECRET IDENTITY OF DEVON DELANEY, at a point when I’d only been writing YA. I knew I wanted to write about a girl who makes up a fake boyfriend, and I thought it would be a lot funnier and more realistic if she were thirteen instead of sixteen or seventeen. 4. What books can we expect from you in the future? I have another YA, ACES UP, coming out on August 10th, and a new tween book, RULES FOR SECRET KEEPING, out in October. 5. What books or authors inspire you to write? I have a lot of favorite authors – Meg Cabot, Sarah Dessen, Sarah Mlynowski, Marian Keyes. But I get most inspired by those authors who keep at it and never give up. I love when I read first-sale stories in people’s blogs, especially if they give tons of gory details about all the years of rejections. 6. On your blog, you talk about TV shows sometimes. What are your favorites? Okay, but you can’t judge! I really have horrible taste in TV shows. But right now my faves are Big Brother, Kourtney and Khloe Take Miami, The City, and The Next Food Network Star. I also DVR all the reruns of Gilmore Girls to use as writing rewards. Nice interview. :) I'll be looking out for Aces Up in August. I don't care for her TV shows, except for Gilmore Girls. 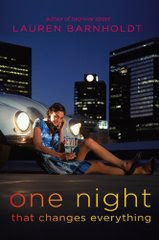 I can't wait to read One Night That Changed Everything!! Great interview! I love hearing about an author's inspirations and future plans... It's a nice little peek behind the curtain. Great interview! I love Lauren's books and think it's awesome she rewards herself with reruns of Gilmore Girls. Nice interview. Can't wait to read the book. Thanks for the interview. Do you have an interesting story about your first published? I like that you incorporate some of your own fears into the book. Really great interview :) I like some of those same shows lol. I love the Kardashian's and The Next Food Network Star too! Cool, such a great author! She likes Gilmore Girls and Sarah Dessen! Nice Interview. I haven't read any of Lauren's books, but I've heard great things. Can't wait to pick one up see. Ahh - Sarah Dessen fan here, too. At first I added Aces Up to Goodreads, but then I found out about this one a few weeks ago and was excited! Can't wait to read them both. Great interview! I love reading about an author's inspirations. this interview makes me want to read the book even more. Great interview.